In order to achieve the remarkable rosy colour of this metal, pure gold is alloyed with copper. The particular shade of gold depends on the ratio of copper to gold; the more copper used, the redder the gold appears. Given the strength of copper, this pairing makes Rose Gold tougher than both Yellow and White Gold, offering great durability. Rose gold can be a particularly good choice for those seeking a wedding band or engagement ring that is that little bit more unique than conventional yellow gold or platinum bands. 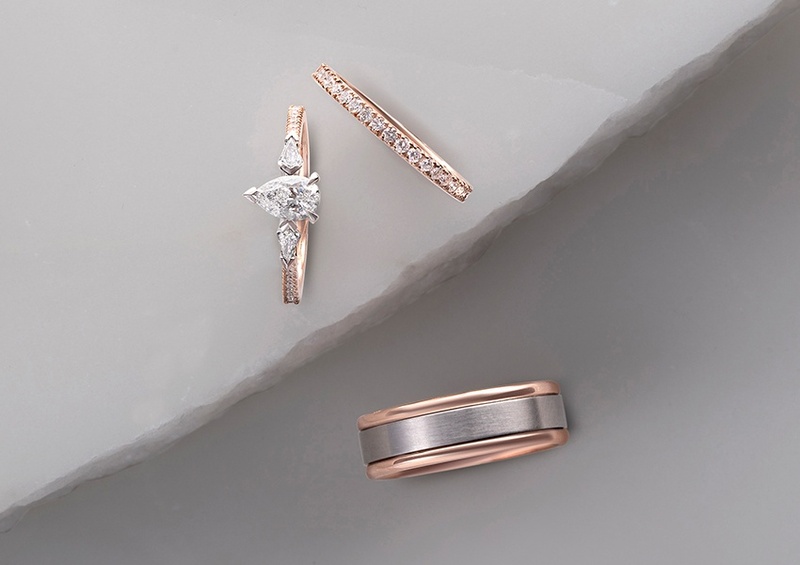 Our Rose Gold Engagement Ring With Pear And Kite Shape Diamonds and Rose Gold Diamond Wedding Ring are a stunning combination that perfectly compliment each other when stacked. These beautiful handcrafted rings are ideal for the bride that desires a blend of classic design with a contemporary flair. If you’re looking to pair your Rose Gold engagement ring or wedding band with other pieces in your collection, we recommend creating a two toned piece to bring it all together and unify the different metals, giving you the flexibility to wear it with cool or warm toned jewellery. Accentuating white diamonds by setting them with white gold on a rose gold band is a popular option. We also receive a number of questions regarding which gemstones compliment Rose Gold. We recommend pairing this warm metal with white diamonds to accentuate this metal’s stunning hue, creating an elegant and timeless aesthetic that will stand the test of time. Rose Gold looks truly magnificent when embellished with white diamonds, especially when it comes to engagement rings and wedding bands. If you’re considering selecting a Rose Gold engagement ring or wedding band, we highly encourage this choice; it brings natural warmth to your jewellery collection and offers a nice change from the traditional Yellow and White Gold. If you’re interested exploring the world of Rose Gold engagement rings and wedding bands, make sure you are following us on to see some of our Rose Gold creations!